Your garage is more than just a place to park your carits a main entry point and an active hub of home and life. 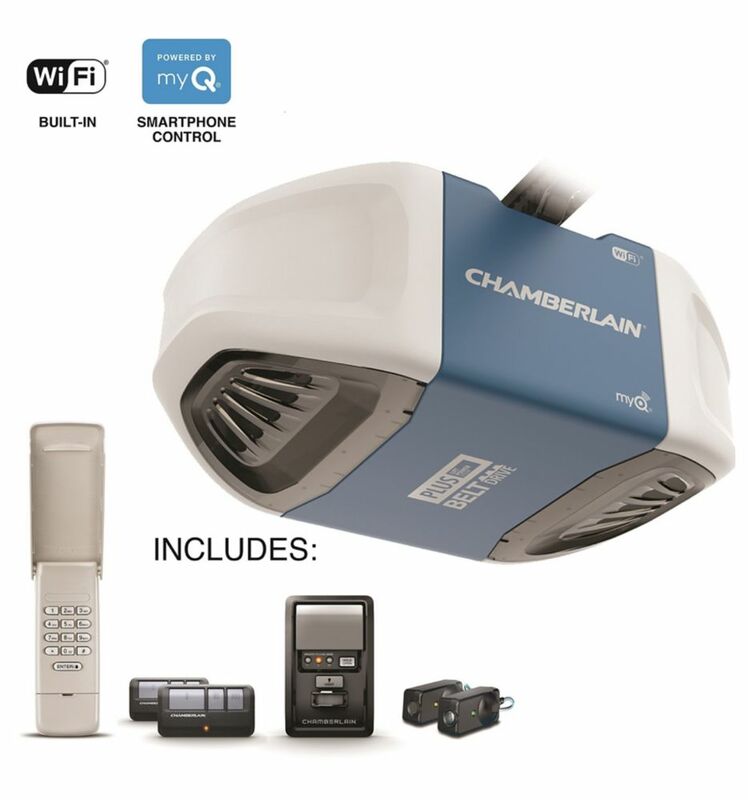 A leader in garage access management solutions, Chamberlains innovative connectivity features make monitoring and managing home activity easy. The B750 runs smoothly, safely, and is customizable to fit your needs and make your daily routine more efficient. The B750 features an ultra-quiet, extra strong steel-reinforced belt drive plus smart technology that gives you complete control. With the Chamberlain MyQ App, you can get real-time alerts, open, close, and know the status of your garage door and morefrom anywhere. Powered by Chamberlains Lift power System , it delivers the highest lifting capacity compared to the 3/4 power class. Direct Drive is the quietest Garage Door Opener on the Market. Unlike conventional garage door openers that use a noisy chain, belt or screw Direct Drive has only one moving part with no moving chain or belt.The motor glides silently along the stationary chain that is embedded in an indestructible steel rail, creating the quietest garage door opener available. The Ryobi 1-1/4 HPs Quiet Garage Door Opener boasts a 1-1/4 HPs motor. An integrated long lasting LED light keeps your garage illuminated and ensures you don't spend time changing out light bulbs. Download the Ryobi Garage Door Opener App to monitor and control your garage remotely from your smartphone. Add any one of the Ryobi Garage Door Opener Accessories to customize your garage with the ability to do everything from playing your favorite tunes to having lasers ensure you park perfectly every time. The Ryobi Ultra-Quiet Garage Door Opener boasts a 2HPs motor, giving you faster openings and prolonging motor life. An integrated long-lasting LED light keeps your garage illuminated and ensures you don't spend time changing out light bulbs. Download the Ryobi Garage Door Opener App to monitor and control your garage remotely from your smartphone. Ensure your opener functions, even when your power fails, by connecting any Ryobi ONE+ battery. Add any one of the Ryobi Garage Door Opener Accessories to customize your garage with the ability to do everything from playing your favourite tunes to having lasers ensure you park perfectly every time. With the Ryobi Garage Door Opener, the possibilities are truly endless. Smartphone-Controlled Ultra-Quiet & Strong Belt Drive Garage Door Opener with PLUS Lifting Power Your garage is more than just a place to park your carits a main entry point and an active hub of home and life. A leader in garage access management solutions, Chamberlains innovative connectivity features make monitoring and managing home activity easy. The B750 runs smoothly, safely, and is customizable to fit your needs and make your daily routine more efficient. The B750 features an ultra-quiet, extra strong steel-reinforced belt drive plus smart technology that gives you complete control. With the Chamberlain MyQ App, you can get real-time alerts, open, close, and know the status of your garage door and morefrom anywhere. Powered by Chamberlains Lift power System , it delivers the highest lifting capacity compared to the 3/4 power class. Smartphone-Controlled Ultra-Quiet & Strong Belt Drive Garage Door Opener with PLUS Lifting Power is rated 4.5 out of 5 by 49. Rated 5 out of 5 by Ken Nortunder from Excellent Product! Installation was easy enough. Runs amazingly quiet. Love notification to app. Good bang for the buck. Rated 5 out of 5 by PJCBSV from Very Good product Very quiet compared to my old garage opener. I love the alerts on my phone whenever it is opened and closed. I recommend this product. Thanks The Home Depot. Rated 5 out of 5 by Super Ju from Ultra quiet Very silent! I don’t even hear the door opening from the house anymore! Happy with it! Rated 5 out of 5 by Adou from Great features Simply Amazing. I bought this a month ago The product doesn’t make any noise and on top of that with the mobile application you can remote control it. Rated 4 out of 5 by Tyler from Great product I've had my garage door opener installed for about 3 months now and I have no complaints with its operation or funcionality to date - in fact, I'm quite pleased with the devices performance overall. On multiple occasions a guest or friend has commented on how quiet the opener is compared to their openers. The smart-phone connectivity is also a nice feature, as I get alerted whenever the door is operated. This is also a very practicial feature because now when I receive a delivery/package, I can open the garage door for the delivery person (who I can see on my video doorbell), enabling them to deposit the package safely inside my garage. The only reason I give it 4 stars instead of 5 is because it took much longer to install than the suggested 2 or so hours that is noted in the instructions (especially if you have to install the mounting brackets and blocking; and run all the wiring from scratch...by yourself). I purchase this on Black Friday so excellent bang-for buck. Recommended. Rated 5 out of 5 by Mohammad from Great value for maney Bought this on a great discount. Totally worth it. Does this opener come with the rail for 7' height garage door? Hi Ian, yes it does. It slows down as it closes for my garage door. Do i need to purchase anything extra to be able to view if my garage is open or close with this garage door opener? No you do not need to purchase anything extra. The old model required a hub, the new model has it integrated. You use the app on your smartphone for alerts when it opens, closes or is left open. The app also lets you view its current status and how long it has been opened or closed for. Hi Laura, we would like to provide a meaningful solution to the issue you are experiencing. Please email us at social@chamberlain.com and mention this question. The picture shows two remotes included. The details say remotes are not included. Which is it? Picture also shows an external keypad and an indoor hard wired opener. Are they included as well? Thank you for your question. This opener does come with two remotes, a keypad, ​and the wall control. I have a double car R18 door. It works fine. Hi Brian, as long as your garage door is under 10ft in height and is properly balanced, our openers will work. Our garage door openers are designed to accommodate the weight of reasonably sized residential garage doors, even ones with insulation or heavy-duty weatherproofing.